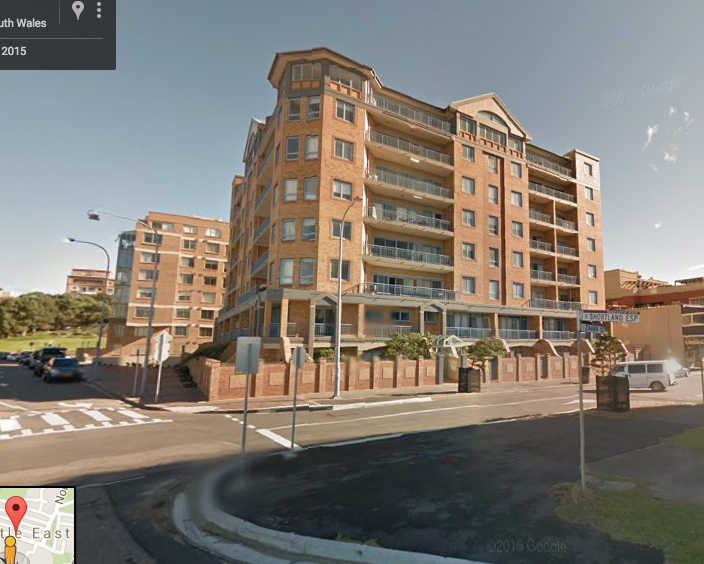 3 Devonshire Lane, Newcastle NSW Australia, is up for auction on 3 August 2016 (see photo, left). The cottage we in Newcastle knew in the 1980s & ’90s as Kurt’s Coffee Lounge is still standing on the eastern side of the narrow Devonshire Lane (a.k.a. Devonshire Street). I had to think of when I first went to the late night cafe. It was about 1995. I was at Newcastle University at the time. A group of friends – guys & girls (acting in plays) – went there one night and I tagged along. It was late and we were already full of food & red wine. 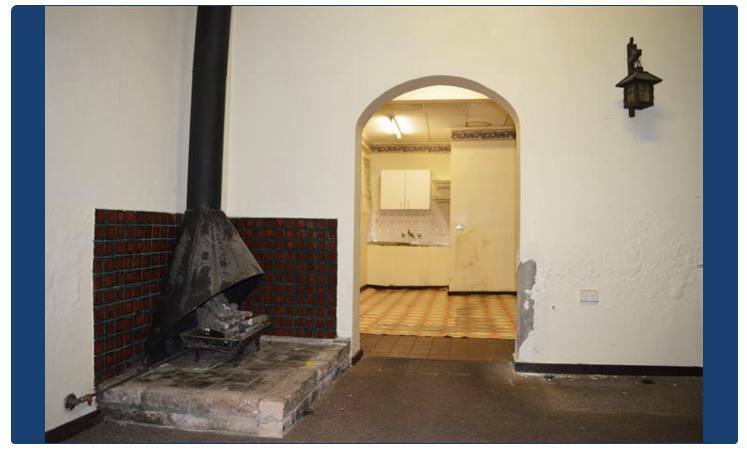 The building is 3 storeys – rather, 2 with an attic (the attic, according to someone on Lost Newcastle Facebook Group, was closed off after the 1989 earthquake) – the eating, sitting floor was the 2nd one. We would order coffee and toasted sandwiches. It was all very civilised and what struck me was no-one made an arse of themselves; they were all very patient, waiting for their beverages and snacks to arrive. After someone on Instagram told me about the auction, I jumped on the Trove website to try and find out how old the building is. It seems it was the dwelling of one Richard Cook, who also owned a dancehall that was next door to the south (see the map, below). 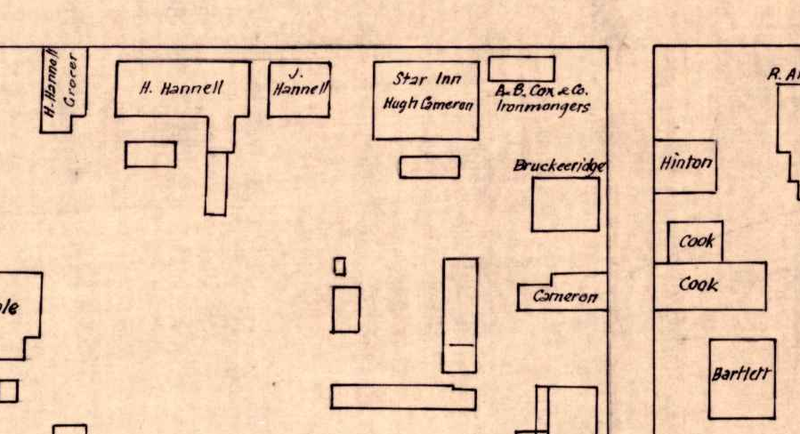 1870 Map showing Richard Cook’s dwelling next to the larger dancehall (Cultural Collections). 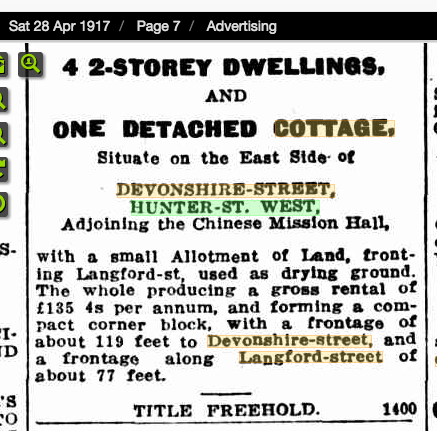 A clipping from The Newcastle Morning Herald, 28/4/1917, indicates the cottage adjoined the “Chinese Mission Hall”(see newspaper clipping, below). 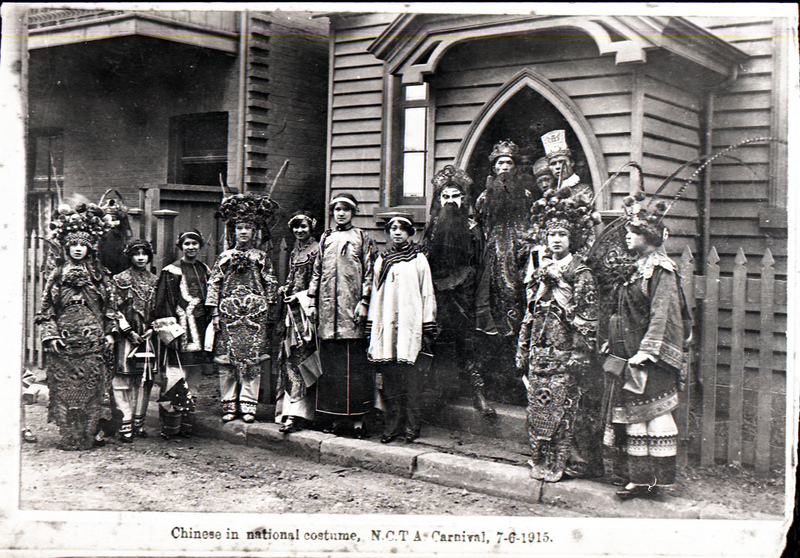 I remembered a photo of a Chinese Presbyterian Church from 1915 (see photo below). Mr Cooks’s cottage is clearly visible on the left, meaning the Chinese Mission Hall was probably the Church, and also the Dancehall (unless the dancehall was knocked down and a new structure was built for the Church / Hall). Other mentions of the cottage indicate that for a while in the late 19th century it was the business residence of a phrenologist, Prof. Allard, who amazed Novocastrians by predicting the future by reading the bumps on their heads (see newspaper clipping, below). 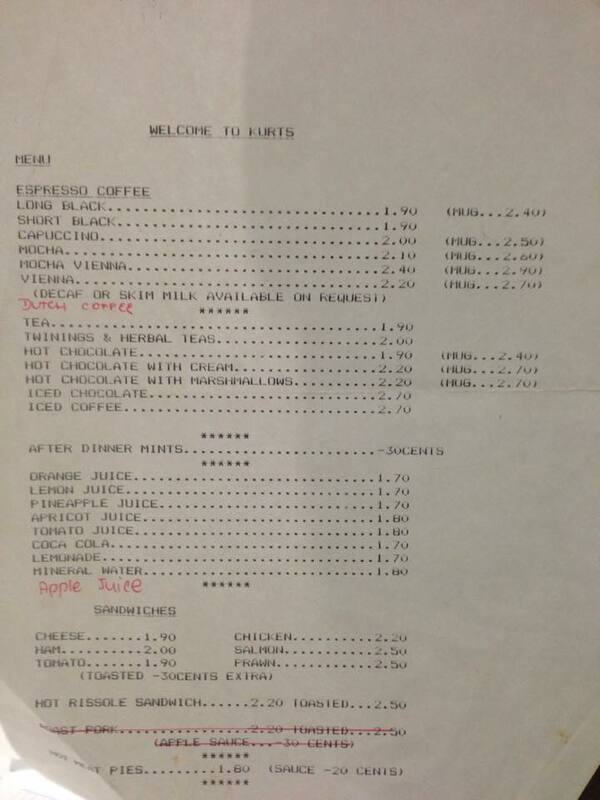 As for the history of Kurt’s Coffee Lounge, the first owner, Kurt Piccardi (well-known restaurateur and after whom the business was named) says in Lost Newcastle Facebook Group that his father did the building up in the 1970s in preparation for the cafe. It was open from 6ish pm until 4am, depending on when customers wanted to go home. Here is a recent interior photo (Colliers Real Estate). I will add more information as I find it. © Matthew Ward, 2016. If sharing on social media, please credit me. • Here is a 1910 photo of the interior of the building. The image is large, but I am sure you’ll appreciate the detail Ralph Snowball’s camera captures. I gather the coffee palaces / houses were places that had accommodation, and served meals including coffee, tea, but not alcohol (as part of the Temperance Movement), but I’ll have to check on this. 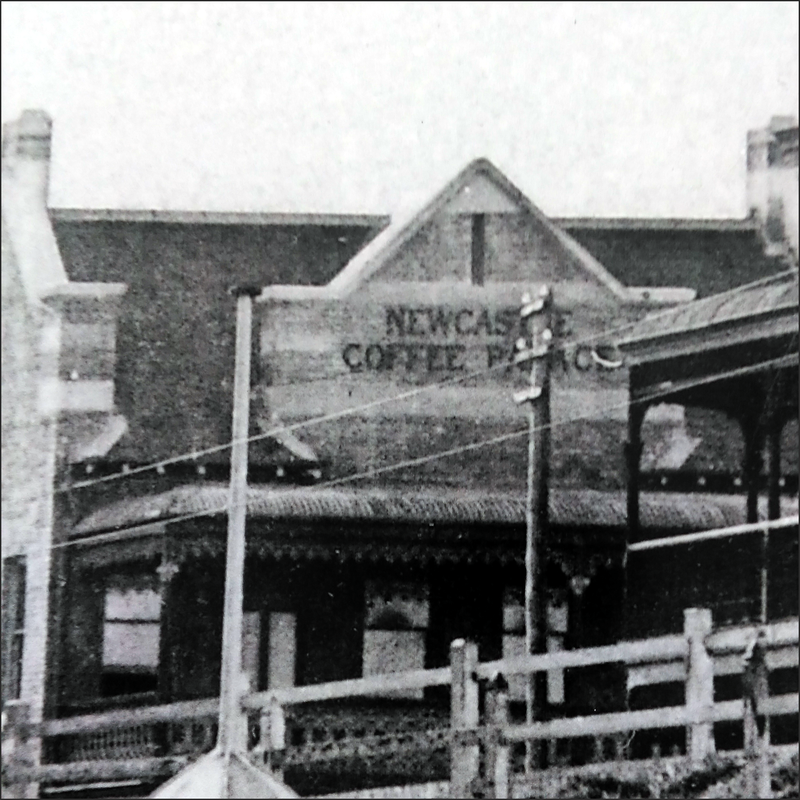 There was also a coffee palace on Scott Street, next to the Longworth Institute, during the same time. More info as I find it. If you haven’t already, please follow my WordPress account.